This is a dark story, but it’s also quite fun. 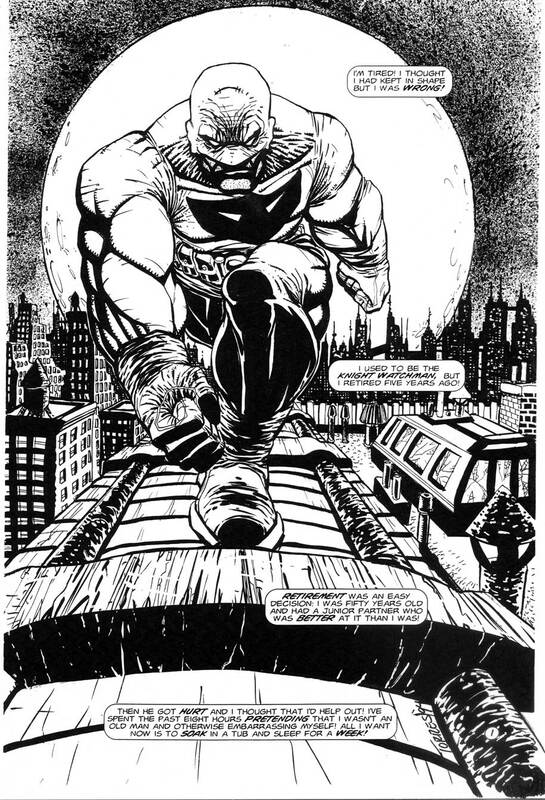 The Knight Watchman has come out of retirement after five years because his former partner, and successor, Galahad was injured and criminals are running amuck in Midway City. However, after a night on the town chasing crooks, he’s ready for a rest. 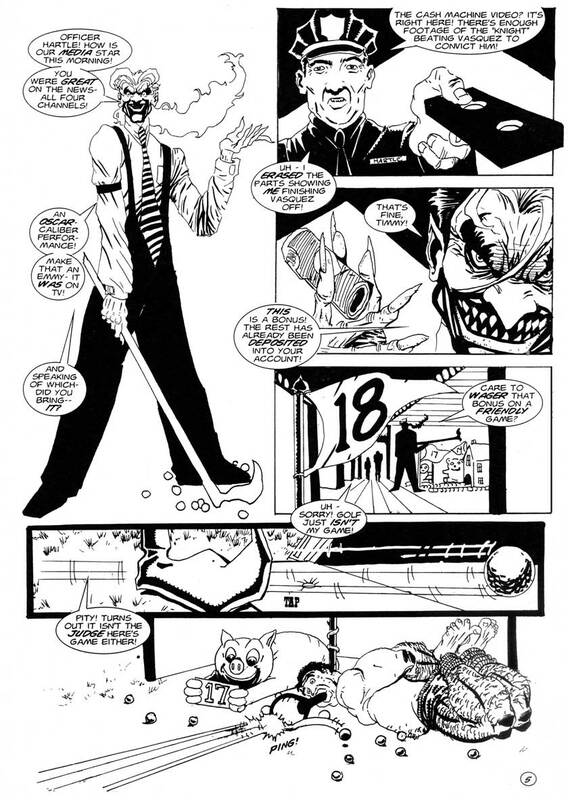 Unfortunately, he discovers that one of the hoods that he turned over to a police officer was beaten to death and the cop is blaming the Watchman. 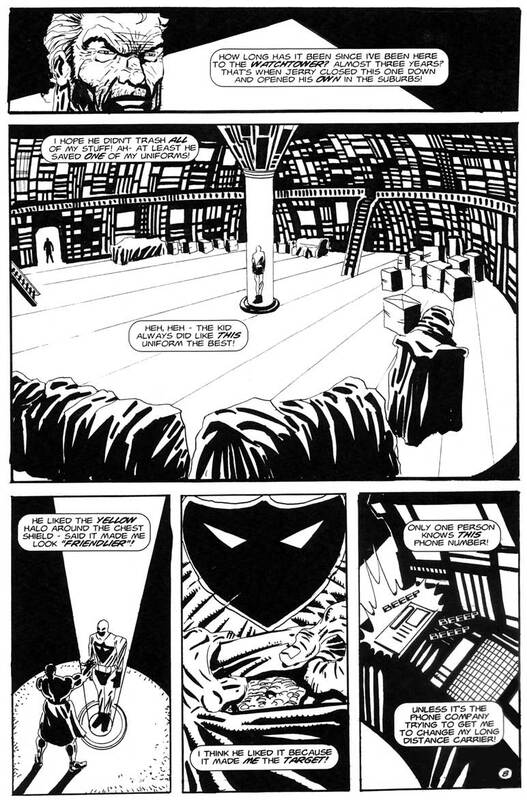 Once more into the fray, we follow the Knight into his old headquarters, the Watchtower, where all of his uniforms and equipment have been stored in mothballs and boxes by Galahad. He locates his motorcycle, the Iron Horse and heads out to discover why Officer Hartle was framing him for murder. 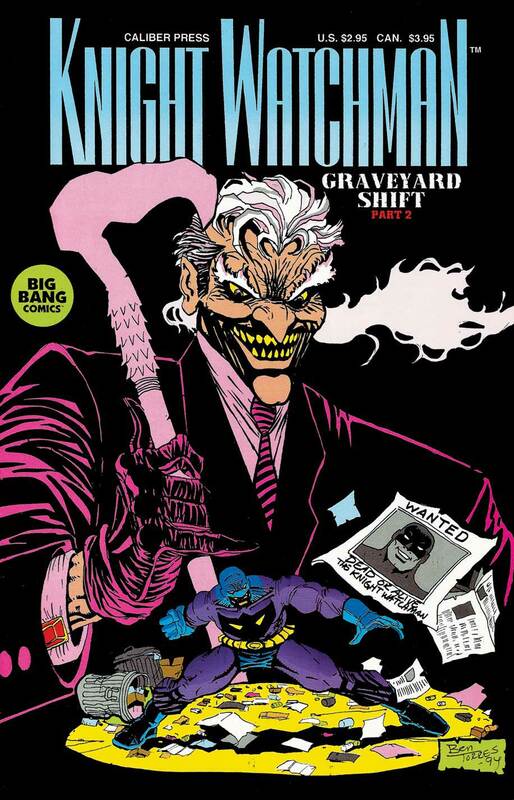 We, as readers, have already seen Hartle collecting his payoff from the nefarious Pink Flamingo, who is also responsible for Galahad‘s injury, Midway City’s crime wave, and is partnering with acting Mayor John Princeton to put vigilantes like Galahad and the Knight Watchman out of business. 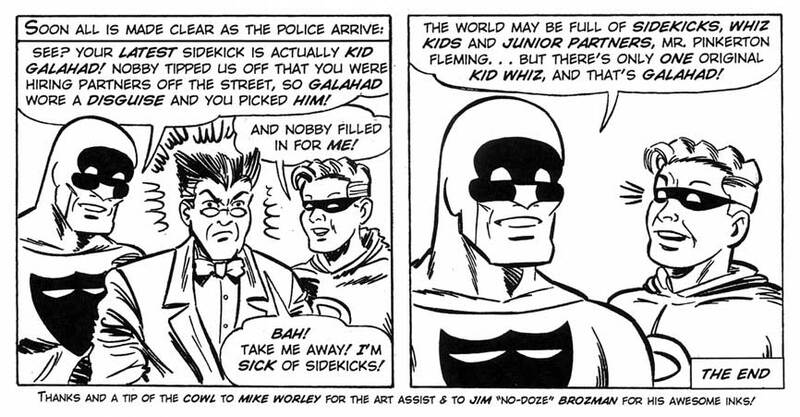 The Mayor wants Galahad to join the police and run the Badge program – – armored super-hero cops which Mayor Princeton will use to clean up the crime wave – – including the Flamingo – – and ensure his reelection. 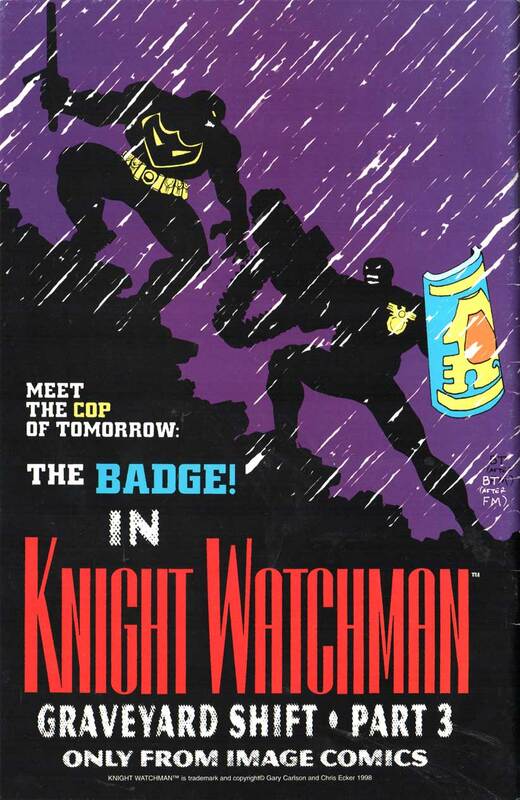 Meanwhile, the Knight Watchman has tracked down Officer Hartle to a room in a skyscraper high above Midway City, but when he opens the window to pay a visit to the dirty cop he flips a tripwire. Unfortunately, it’s not an alarm. It’s a bomb. BOOOOM! 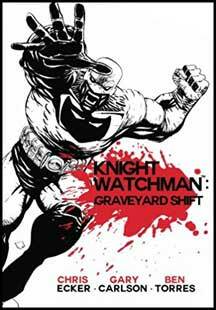 The second story in the issue explores a bit of the history between the Knight Watchman and his partner Kid Galahad. 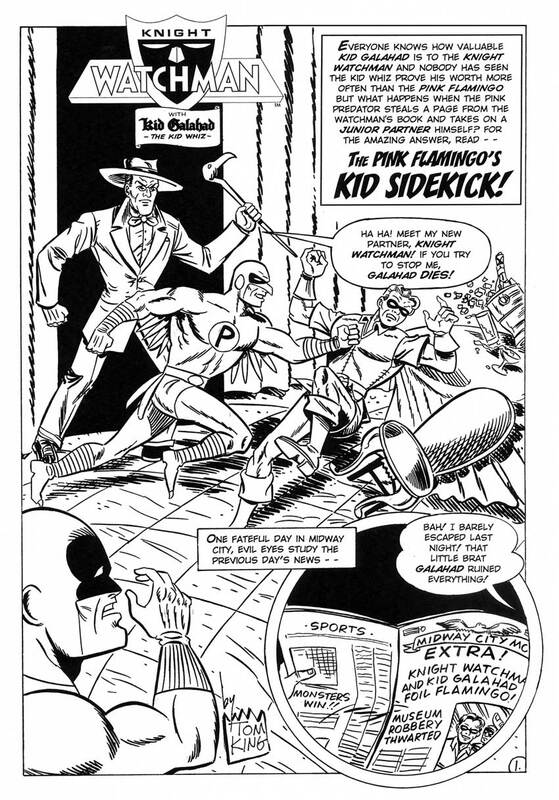 Penciled by Chris Ecker and inked by Jim Brozman, “The Pink Flamingo’s Kid Sidekick” details how the Pink Flamingo, tired of being outnumbered two to one by the Knight and his squire, decides to take on a junior partner of his own. An easy chore for the Fagin-ish criminal who controls a gang of street urchins. Soon, the Knight Watchman and Galahad interrupt the Flamingo as he robs a museum, accompanied by his new partner. The Pigeon is older, bigger and stronger than Galahad, but the Kid Whiz has years of training and easily defeats his opponent. The Pink Flamingo escapes, only to reappear soon enough with a new and improved Pigeon – – a girl! “Jeepers – I can’t fight a girl,” says Galahad before discovering that she is a he; a boy wearing a wig – and bombs in his brassiere. The Flamingo escapes, ditching his sidekick who in turn helps our heroes. He and Galahad trade uniforms, and when next they meet the Flamingo is flattened by his own sidekick. 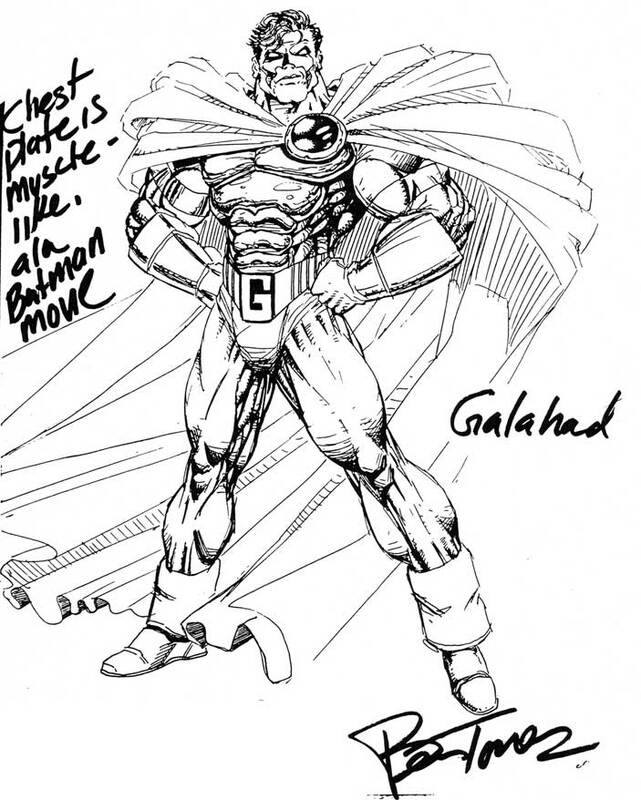 Next up in the issue is a Ben Torres’ Sketchbook, showing Ben’s original designs of all the main characters, some used and some unused, going back to the Knight Watchman’s original design with an eyeball as his chest symbol. 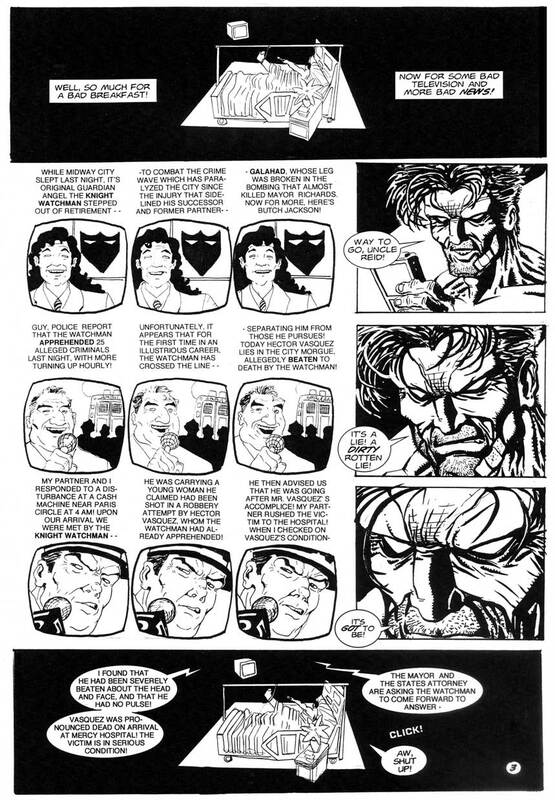 Finally, the issue ends with a back cover by Ban Torres featuring the Knight Watchman facing off against a super-cop Badge in a nice homage to Frank Miller. 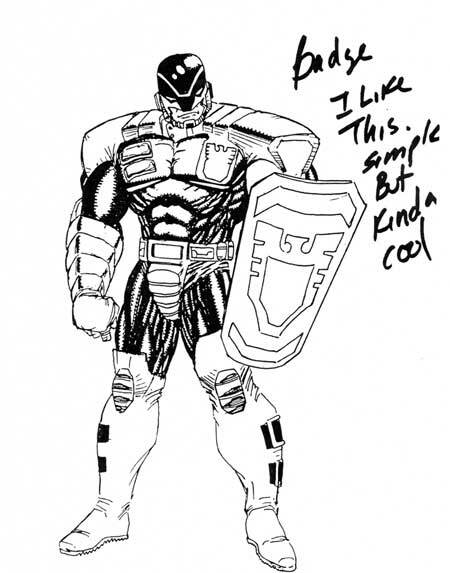 Big Bang Comics, Knight Watchman, and all related characters are © and TM Gary S. Carlson and Chris Ecker.